Me and Fronz, a Harris Hawk, which is a non-native species to Canada. This past Saturday, Rob and I visited Wye Marsh in Midland, Ontario for the first time. 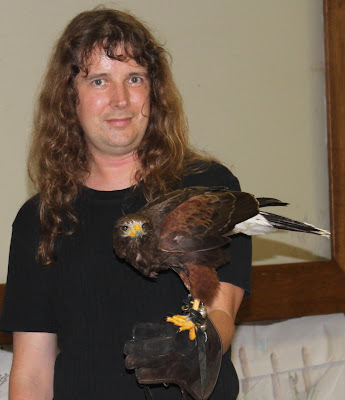 We had registered for a "Behind the Scenes, Birds of Prey Program", months ago, after learning about it from a friend. Entrance to Wye Marsh in Midland, Ontario. We weren't sure what to expect, but weren't disappointed. It was an introductory class to birds of prey (which we already knew quite a bit about), and also in the the sport of Falconry. We got to see some really cool looking raptors not native to Canada and learn a bit about them. The is "Jay-Jay", a Speckled Owl, mainly found in Indonesia. 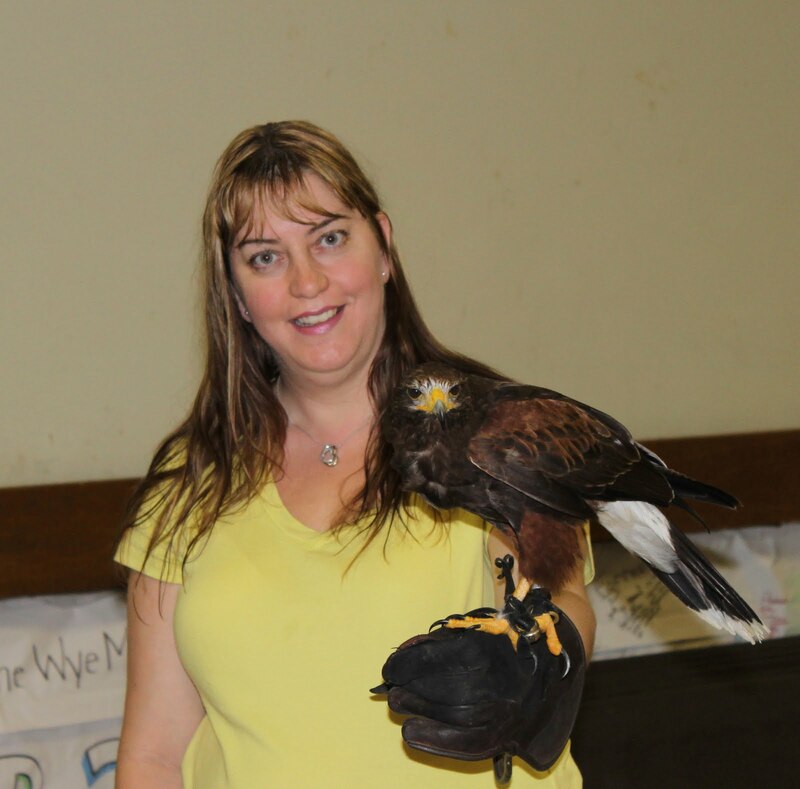 The best part though, for both of us, was getting to "fly" a Harris Hawk. Meaning, it flies to you from his perch, lands on your gloved hand, and then eats the food your holding for him. It was the first time we did this and it was really cool! Mike, the falconer, felt bad that the weather wasn't co-operating and that he couldn't hold the course outside in the aviary, so he gave us all free passes for a future visit to the park. We had another nice surprise while there. We met Casper, a Barn Owl, and found out he is one of Silo's off-spring. 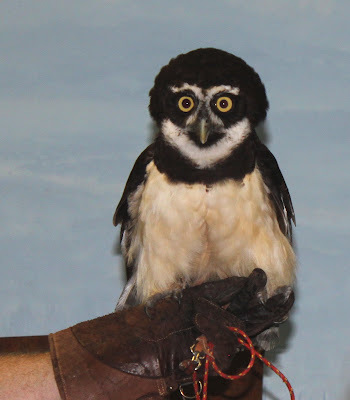 Silo is the Barn Owl we sponsor at the Muskoka Wild Life Centre. This is the second chick of Silo's we've encountered, as "Jazz" at Mountsberg is also one of hers. Casper, a Barn Owl was having a nice sleep on a rainy Saturday afternoon. Another reason Rob and I had been wanting to visit Wye Marsh was their involvement in bringing back the Trumpeter Swan from near extinction. The original captive breeding pair of Trumpeters at Wye Marsh were "Big Guy" and "Lady Girl". Big Guy and Lady successfully raised the first cygnet in 1990, and she became known as "Pig Pen". In 1993, Pig Pen and her mate became the first wild nesting pair of Trumpeters in Wye Marsh in over 200 years. The one Trumpeter Swan we saw at Wye Marsh. The rest of them were probably all out in the large marsh. Enlarge this picture to read the touching story about Pig Pen. We had a great day at the park, despite the weather, and look forward to returning for some bird watching, snow-shoeing and more falconry courses! So cool that you got to hold them. That must have been thrilling! ANOTHER GREAT DAY IN PEC!